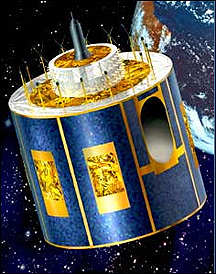 Meteosat is a series of European geostationary weather satellites developed in conjunction with GARP (Global Atmospheric Research Program). Although ESA (European Space Agency) originated and continues to control the Meteosat network, Eumetsat (European Organization for Meteorological Satellites), created in 1981-86, has overall responsibility for the system. The main goal of the Meteosats is supply 24-hour, visible and infrared cloud cover and radiance data. Three pre-operational craft were launched in 1977-88 before the Meteosat Operational Program (MOP) began with the launch of Meteosat 4. Meteosat satellites closely resemble their American and Japanese counterparts. Each measures about 3 × 2.1 meters and has an on-orbit dry mass of 320 kilograms.